Our local customers know that when it comes to garage door maintenance services, there's no one better to call than our company. Our experts understand the importance of preventative maintenance when it comes to ensuring your system is able to avoid a lot of potential problems. This service will make sure your door operates normally and keep you from having to spend more money on repairs. Most homeowners underestimate the importance regular lubrication provides. During our maintenance appointment, our technicians will make sure your garage door springs, hinges, and rollers are all well lubricated. The more these components function optimally, the smoother your door can perform. Another important part of regular maintenance we perform is making sure all the hardware parts are completely secure. It may seem negligent to tighten all the bolts and screws, but these ostensibly minor things can easily accumulate into a larger issue. Over time it is normal for hardware parts to become loose, but that doesn't mean that they should be left that way. During our garage door maintenance visits we will make sure the tracks are properly aligned and secure, the hinges are in a good condition and haven't developed rust, and that any nuts and bolts have not come loose. As they age, springs and cables will need to be adjusted to ensure the door raises and lowers correctly and that it is safe when operating. These components are in charge of counterbalancing and pulling your door's weight, so they are under constant stress, and must be examined not only for damages, but also that their weight distribution is correctly balanced. 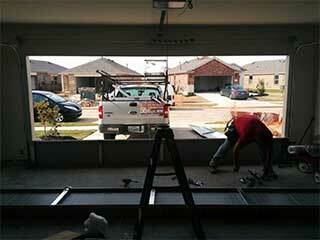 Call our professional team at Garage Door Repair Jupiter to set up a maintenance appointment today. It's extremely important that you have a professional check your door on a regular basis to ensure there are no problems you will have to deal with in the future. As the most skilled and reputable company around, we are ready to help our local customers ensure the continued function of their garage door. Call us today.